The combination of the Johnson Quick Reeve Crane Block and your crane’s Quick Reeve Boom Tip combine to make a reeving system that’s unsurpassed in productivity, safety and speed. Simply stand the block up and tilt it over on its positive support hook base, pull the quick release retaining pins, and run your rope (with wedge socket connected) through the block. It’s that simple! There are no drop away trap doors to get in your way or become bent or damaged, and the quick release retaining pins stay with the block at all times. Available tonnage capacities from 10-140 tons. Larger capacities available upon request. Sheave sizes from 10" - 30" 1 thru 9 sheaves. Forged steel hooks 5-30 tons. Dual-action swivel/swing roller thrust bearing hooks. 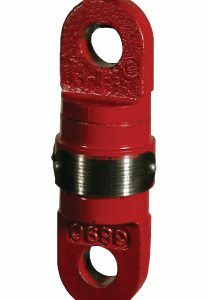 Quick release, zinc plated, rope retention pin meets OSHA requirements for rope retention. Pin cannot be completely removed from block to avoid pin loss. Johnson J-Latch™ heavy duty steel, lockable, spring loaded latch meets OSHA personnel lifting requirements. 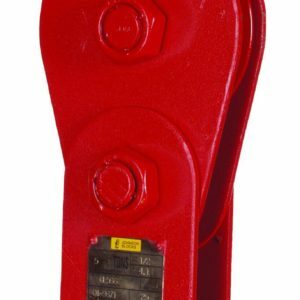 Provides a fast hook deformation inspection point. Direct channel sheave lubrication through center pin. Rope end fitting will pass through block.